We started OyBaby as new parents, looking for ways to instill a sense of Jewish identity in our then 6-month old son. Seeing that no products existed for Jewish babies, we decided to invent one! In November, 2003, we introduced the first OyBaby and were overwhelmed and humbled by the positive response. Parents from around the world have written in to thank us and share their stories of ways in which OyBaby has become a part of their lives. Gabrielle's dad in Fairfax, Virginia wrote in to tell us that his daughter loves singing the Shabbat blessings she learned while watching OyBaby. She sings them at the top of her lungs while walking through the local mall. Zachary in Los Angeles insisted on an OyBaby-themed party for his birthday. The steady stream of emails from happy customers with stories like these is ultimately what made us decide to create OyBaby 2 in 2005. That, and the fact that Rob really wanted a new video camera. OyBaby LLC is literally a mom and pop operation. The two of us brainstorm ideas for the scenes, corral our kids and the kids of our friends to star in them, film the videos, market them, and ship them to you and our retail partners from our humble "World Headquarters" in Mercer Island, Washington. Rob does all the filming, editing, motion graphics, packaging and web site design. 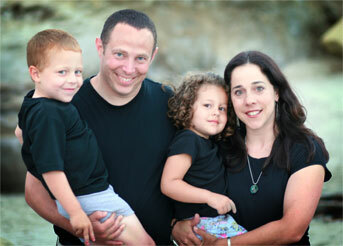 Lisi's a full-time mom, freelance photographer, and handles the sales and operations for OyBaby. Our vision was to build a product around Jewish music-the kind we both grew up enjoying at Jewish summer camps and in youth groups. 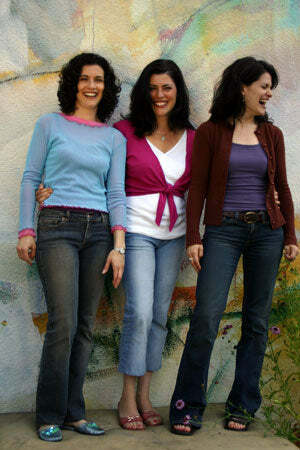 Lisi's friend Stephanie Schneiderman, along with her sisters Lisa Schneiderman, and Kim Palumbis, were the perfect people to help us create that sound. This immensely talented trio has sung together since childhood, entertaining family, nursing homes, camps, and synagogues. Stephanie is an accomplished singer/songwriter that has recorded and toured extensively as a solo artist. She was selected as an opening act for the Lillith Fair concert tour in her native Portland and has also opened for acts such as the Chris Isaak and Hall & Oates. As on the first OyBaby, Stephanie created the lush arrangements for OyBaby 2 and recruited our incredibly talented studio musicians and chorus singers. You can hear her solo music at www.stephanieschneiderman.com. Lisa and Kim share in the lead vocals and assisted their little sister Stephanie on the arrangements. Lisa is a public relations and marketing consultant with an international clientele. Kim is a former schoolteacher and now a full time mom and music teacher. She gave birth to her youngest daughter just days after recording the first OyBaby. Once again, thank you for your support. Enjoy, and tell your friends! Have an idea? A question? A comment? We'd love to hear from you.